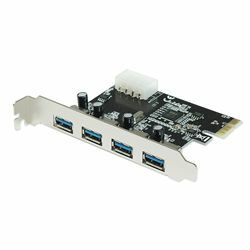 Add four SuperSpeed USB 3.0 ports to your desktop PC with this super-compact single-lane PCI-e expansion card. Utilizing PCI-e 2.0, it provides upwards of 5Gbps data transfer speeds for your USB 3.0 devices. It uses a 4-pin Molex plug from your power supply to supply extra +5V power to the USB ports. Compatible with Microsoft Windows 2000+. USB 3.0 cables not included.